Our 90PL series is the first bulk laundry delivery cart that comes with style, class and luxury appeal. 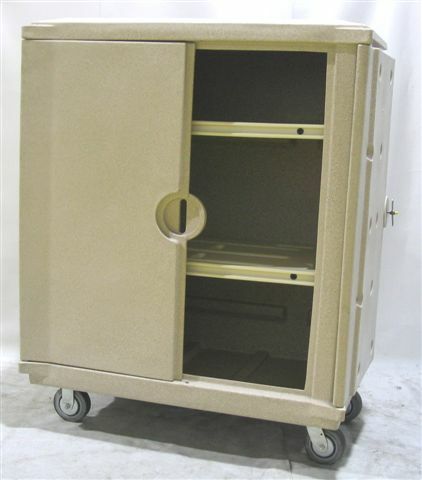 It is a high-capacity, attractive clean linen delivery cart designed for hospitals, nursing homes, upscale hotels, resorts, and other properties where a premium is placed on visual appeal as well as durability and longevity. Choice of Key Lockable Doors (for security purposes) OR Vinyl Flap Closure to protect contents. Both types feature a permanent hard top. Cart comes in choice of many colors and choice of caster arrangement. Comes with plastic base (standard) or metal base (same price). When ordering please specify if you want hand holes and/or drain holes.